SURPRISE, Ariz. -- Juan Gonzalez quietly goes about his days, moving from the field to the training room to the shower to home. He doesn't say much, leaving people to read his actions, to scour his face and his body language for some sort of explanation. "It's gonna take time to know Juan," says Rudy Jaramillo, Gonzalez's first minor-league manager. Gonzalez's reputation always precedes him, coloring the blank parts of his personality. You hear he's a prima donna, and shy becomes sullen. You hear he's selfish, and a nagging injury becomes an excuse to rest. There are two sides to everything, and Juan Gonzalez is no exception. There are bits of truth in both. "I'm shy," he confirms. "I don't like to talk too much, but I don't have a problem with anybody." It seems sometimes people have a problem with him, though. His outspoken hatred of his time in Detroit, his dispute with the Texas Rangers over whether he was really injured (he was), his propensity to crawl into a cave when things don't go well -- all that has painted a picture. And it ain't pretty. Some facts are hard to ignore. For instance: More than 600 times, his name and the word "spoiled" have appeared in the same newspaper story. That's only about 100 fewer than Ozzy Osbourne's name with the word "Satan." Juan says he's misunderstood. "You know, it's just life," he says. "I have nothing negative in my heart." That's the Juan very few people get to see; the Juan who runs a tab at a Puerto Rico drugstore so no one will be without medicine. The Juan who's a history buff, who loves politics and geography. Juan the joker, believe it or not, who has his hands out to snag a bottle of moisturizer, thrown from across the clubhouse by his buddy Benito Santiago. Gonzalez makes a beautiful, Dwight Clark-esque catch. Walking away, he raises his arms and yells, in Spanish, "Touchdown 49ers!" That's him, too: goofy and silly, feeling comfortable and safe in the Kansas City clubhouse. It's confusing. Cancer or cure: Which is he? That's the question the Royals brain trust asked as a $4.5 million contract was inked during the off-season. It's the question they decided to let Juan answer for himself, with no baggage, no skunks in the jury box. "I always say," philosophizes skipper Tony Peña, "you cannot judge people until you've been around them." Juan Gonzalez Sr. taught junior-high kids for three decades, and learning was prized in the Gonzalez home. He retired three years ago. Both of Juan's older sisters graduated from college. Like them, Gonzalez is a sponge for information. Just because he isn't talking doesn't mean he isn't listening intently. "He'll tell you about Kerry and Dean and Al Sharpton," says Luis Mayoral, Gonzalez's friend and adviser. "He'll talk to you about what's happening in Iraq, in Afghanistan. He will talk Kennedy with you. He'll talk Nixon and Truman." While his sisters went to college, Juan's path was destined to be different. Scout Sandy Johnson first met him when Gonzalez was a shade over 15 years of age. Juan was skinny, his powerful body still a training table and weight room away, but Johnson could see something. He met with Iris Vazquez, who served him coffee and told him to take care of her son. When Juan moved to the United States, he knew maybe three words of English. Later, when success came, he paid for classes, the big slugger struggling over simple grammar with a tutor from Chicago. He still has troubles, often working hard with context clues and familiar words to guess a question. "In this life, you're learning something new every day," he says, "and you need to adjust." Much of his reputation for sullenness is born here. Of course, some of that reputation is because he is sullen -- and spoiled -- at times. There are the missed medical appointments. Taking a limo from Atlanta to Birmingham, Ala., to see his doctor. Refusing to play in the All-Star game as a reserve. Bits of truth in both, remember? "Juan has always been clean-cut," Johnson says. "He's never been in any trouble. He doesn't drink. He doesn't smoke. He's just an All-American guy with a big heart. He just doesn't talk a lot." Back in rookie ball, along with fellow no-namers like Sammy Sosa, Juan was simply a Latin kid trying to learn a new culture. Jaramillo noticed something else about Gonzalez, something that would define all that's good and bad about him. Jaramillo meant it as a compliment, but you can see how it also can be considered a curse. "When Juan wants to get it done," he says, "he can get it done." When he wants to. That's been the knock; he turns it on and off, his current state of mind dictating his effort level. During spring training, Gonzalez sat at his locker, nursing a calf injury that would keep him out a week. "I feel better today," he says. "The doctor checked me out, and it's OK. Nothing bad." His problems in Detroit were well-documented. In a Sports Illustrated article, the moment he turned against the Tigers and the cavernous Comerica Park was detailed. Tie game, bases jammed, bottom of the ninth, Juan smashed a bomb to the left-center gap. Anywhere else, he's jogging. But in Detroit, it was a highlight-reel out. He checked out. Teammates believed he wasn't hustling. "As sure a Hall of Famer as Gonzalez is, (2000) showed how mental this game can be," current Tampa Bay pitcher Todd Jones, a Gonzalez teammate with the Tigers, told the magazine. "Gonzo was a tormented soul." Juan protested to the team, asking to get the fence moved in. When they refused, he moved out. Not even a gargantuan offer could keep him in Motown. "If he was money-hungry, he would have taken the 140, 150 million," Jaramillo says. "But he didn't. He wanted to go where he was gonna be happy." He tried, and mostly succeeded, in Cleveland. Even there, though, he kept to himself. He didn't venture out, didn't interact with the community. His life was apartment, park, apartment. In Texas, as he had done in the past, Mayoral got a job with the club. He had front-row seats to the Misunderstanding of Juan Gonzalez, just as he had decades ago with his old friend Roberto Clemente. "There are a lot of similarities between Roberto and Juan as far as personality," Mayoral says. "They are both very intense. They are both very proud. Their being introverted throws out the wrong impression. Clemente was not arrogant, and Juan is not arrogant." The latest example came a year ago in Texas. Gonzalez was convinced something was wrong with his right calf. He told the team it was torn. They told him it wasn't. General manager John Hart made public comments about Juan's desire, calling him out. Hart didn't return phone messages left by The Star. Gonzalez would make his way to the park for rehab, still insisting something was wrong. "I would see Juan," Mayoral says, "and I had to pump him up emotionally every day." Finally, orthopedic surgeon James Andrews in Birmingham confirmed Juan's suspicion. There was a tear. He'd been right. The team had been wrong. In September, a Dallas surgeon repaired the calf, and Juan went home to Puerto Rico to recuperate. Less than six months later, taking a huge pay cut, he signed with the Royals. The last few years have damaged Gonzalez, now in his 16th season. He might not show it, preferring to give everyone a smile and a shoulder shrug, but he knows. He and Mayoral have talked about it, about the importance of him playing like a superstar again. And the limb the Royals have crawled out on with a big-dollar contract hasn't gone unnoticed, either. "Juan knows this is a year when he has to reinvent himself," Mayoral says. It seems he is doing just that, but Juan is famous for being cheery during spring. There are some real signs, though. Together with a workout guru, he has devised a personal routine to keep him healthy. He and Carlos Beltran have become inseparable. Juan calls Carlos "kid," which makes Beltran laugh. For the first time in years, Mayoral doesn't have a job with Juan's team. "There are different kinds of people inside the organization," Gonzalez says. "Here is more different. There's a big group of Latinos here, and everybody is more comfortable." His career is winding down, and he still has things he wants to accomplish. He wants 500 home runs; he's got 71 to go. He wants 1,500 RBIs; he's got 113 to go. Then, there's the biggest honor, one he can't even really talk about. 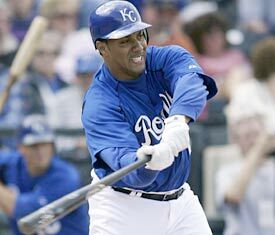 Juan Gonzalez is playing for the Royals, but he's also playing for his legacy. And when Juan wants to get it done, he can get it done. "Juan wants to retire with a great possibility of going into the Hall of Fame," Mayoral says. "He's close."